While my Mom was at our house over the holidays I handed her a stack of fabric, a pattern, and my two kids, as my husband and I headed out the door on a date. When I got back both kids were fast asleep and all of the blocks were finished, in just a couple of hours! There’s a whole lotta polka dots in this quilt….but I think it works with the large blocks and big scale of the pattern. I quilted it by doing a semi-large stippling around the center circles, and then went back and added a swirl in each circle. This is the crib size of the Kaleidoscope pattern, it measures 42″ x 51″. I wish I was as productive as your mom! It's a great quilt….your mom did a fantastic and quick job ,and the quilting you did looks great! Ohhhh I love this! I have always wanted to do an all polka dot quilt. I love how this has the look of the little neckties, but it's subtle. CUTE! I know it's silly but I have a request. I tried your finish a quilt tutorial to make a baby quilt and I enjoyed it so much. I just wanted to suggest or ask if you could answer some beginner quilting questions on your blog? Good for boy or girl, any Mom would love it. great quilt! and i can't believe she managed to get the kids situated AND made the quilt all in one night. WOW! i love love love this pattern. i will have to give it a try… adding it to my to-do list. I love Kaleidoscope patterns…I put plenty of dots in my Stashbuster (MO 2)…I think Kaleidoscopes really lend themselves to the high contrast of polka dots! Lovely! What a great color scheme! It looks fantastic! Your mom is awesome and I LOVE this quilt! mom's are the best. this is a great quilt. 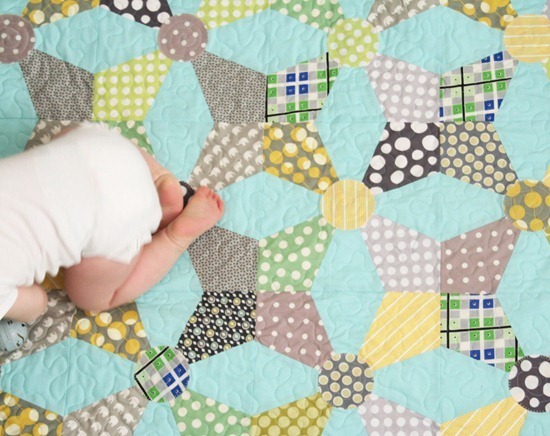 What a sweet baby quilt! Love it! Fantastic quilt! Adore the colors!!! I may have to bust out my wallet and spring for that pattern now. I love all your pics of it! oh swoon! I love polka dots and I love the pattern! Maybe my little guy needs one too. I am in love with aqua. The combination that you've chosen is beautiful! By the way, may I borrow your mom for a couple of days? I love the color combo, what a great idea! If your mama ever wants to visit NZ she is so welcome to stay with me :) what an amazing mum! Looking after the kids and whipping up a quilt top. It looks great. Is it a difficult pattern? I love those little elephants, I've spotted them in your work before. LOVE it! Great pattern and colors. And mom. Excuse me, what was her number again? Wow, great job! I love that color combo…it's very unlikely, like you wouldn't just think of it. So I asked you awhile ago about making a quilt out of my duvet cover. I still want to do it but I've been nervous. A quilting friend of mine recommends getting larger quilts professional long arm quilted and this is queen size. What do you say? Should I still try it myself or send it out? The plaid is from Katie Jump Rope while the small scale grey with black dots and the navy with circles and diamonds are from Hope Valley. The grey with yellow and white circles is from Amy Butler's Midwest Modern and the green dots with the darker background and the yellower dots is Amy Butler's sunspots from the Love collection. That is great, I have always been intimidated looking at that pattern but I guess I may be able to try it now that you make it sound a bit easy. Your mom was on a mission…..wonderful quilt! great quilt! love the color combination and that little baby too! 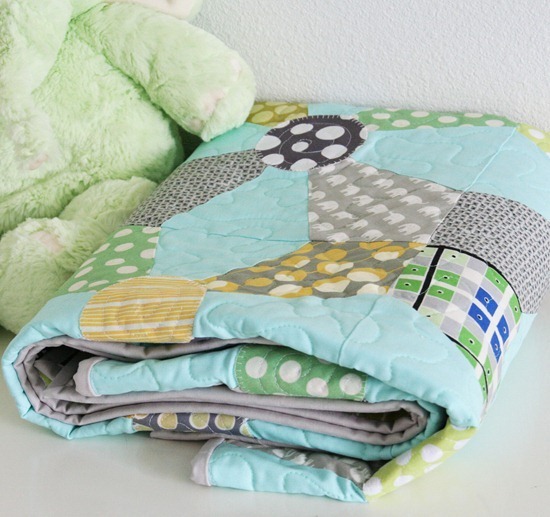 I always love your color combinations…this quilt is really cute!! I just love this! I am bit of a polka dot fan these days. how cool is that?! will she adopt me? love this quilt! LOVE the quilt!! I think it takes my Mom 2 years to get my babies their quilts. Your mom is amazing! I've just discovered your web. I love it. Congratulations from Catalonia. I'll follow you! Wow your mother is super speedy! 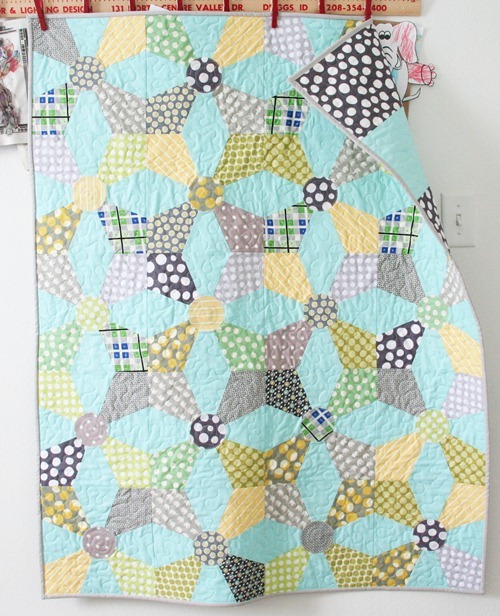 The finished quilt looks amazing…..perfect for bub! I love the Katie Jump Rope in there! These colors are so awesome, it really looks great! Yay for teamwork! your quilts are so charming! This is a beautiful quilt! I LOVE the colors! Love this! What color blue is that solid? It's a great aqua shade.